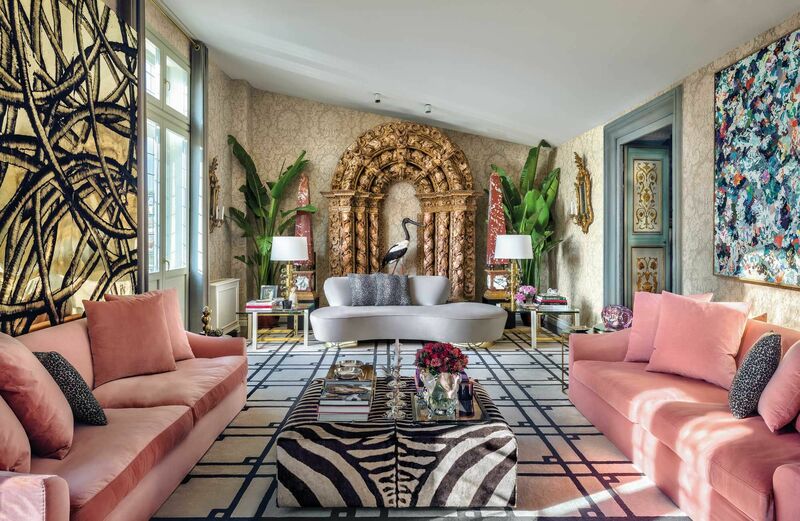 Gorgeous De Gournay wallpaper with animal print, marble busts with displays of coral—the home of Edgardo Osorio and his partner, Ricardo D’Almeida Figueiredo, is a riot of colour and patterns, of contemporary and classic elements, all contained within the stately Palazzo Corsini in Florence. “I love the contrast between the antique and the modern and I can hardly believe my luck, some years ago now, at securing such a gem. I have always been in love with this beautiful palazzo,” says Osorio, who is the founder and creative director of luxury shoe brand Aquazzura, and whose headquarters and design studio are located in the same building, along with a ground-level boutique. There are certainly plenty of contrasting elements in the home, which Osorio designed with interior design firm Casa do Passadiço. The damask gold and cork wallpaper in the living room is matched with a carpet in a geometric pattern, while blush-pink sofas from Meridiani flank a pouf covered in zebra print. There are artworks by Aaron Young, Dan Res and Douglas Gordon, while a baroque-style Portuguese altar from the 17th century is a striking feature of one of the walls. The room looks sumptuous but not intimidating—a place to relax and have fun. The home is like a living scrapbook of Osorio’s loves and lifestyle. A fascination with corals and shells has resulted in a collection, some found at auctions, that covers a wall in the TV room. Each room was designed to have a personality of its own. The dining room features a more stately look, with extensive moulding and panelling on the walls, complemented with columns. A vintage Sputnik crystal and brass chandelier from the 1970s hangs above a Carrera marble-topped dining table from Carlo Colombo. The striking red, along with a zebra-print rug and a marble-topped coffee table featuring hues of golden brown and white, turns a mere foyer into a space that makes a bold statementon its own, even if you aren’t there to linger. A seperate foyer entrance offers a different vibe, with the walls covered in pretty De Gournay wallpaper as Osorio wanted the area to resemble a winter garden. In the meantime, Osorio continues to add to his home treasures found in antique markets, auctions and art and design fairs around the world, making it a design narrative of his life and travels.